Call Kim at 1-800-331-6637 to place an order or Order online now. Repairs can be a real hassle on construction and remodeling projects that incorporate knock-down drywall finishes. On large construction projects that utilize knock-down drywall, there is typically an expert on the drywall crew that utilizes a large sprayer with a pot and an air compressor to make drywall repairs. 1) The expert at spraying and making these repairs has to be on the job site. 2) For smaller remodeling / repair jobs it is not always practical to call in an expert. 3) It is messy. If there is already carpet down or furnishings in the room, chances are you are going to get some spray on something. 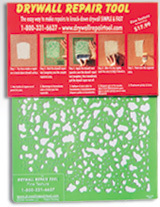 Another option: buying knock-down texture in a spray can. However, the spray can texture generally doesn’t work and is very messy. 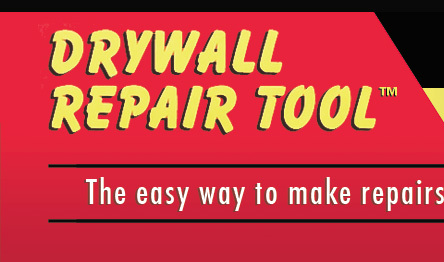 The Drywall Repair Tool provides a quick and easy solution to this vexing problem wherever knock-down drywall finishes are in place.